While fairytales of castles and princesses are mostly popularised by the Western world, the biggest ancient palace that survived until today is located in Asia. The infamous China’s Forbidden City, to be exact. Right now, the palace complex is simply known as “Gugong” or “former palace”. The place has continued to become both domestic and international tourists destination. Here are some of the things you need to note before going to the world’s largest surviving ancient palace. Weekends and Chinese public holidays are undoubtedly the busiest days of Forbidden City. Despite its sheer size, the place can get crowded during these times. If you can help it, make sure to avoid these days to get the most out of your Forbidden City visit to avoid hordes of people. You can find Chinese public holidays quite easily in dedicated websites such as China Highlights, that posted Chinese holiday schedule for 2019 to 2021. There is only one entrance in the forbidden palace, and making a mistake can cost you 20 minutes of walk. 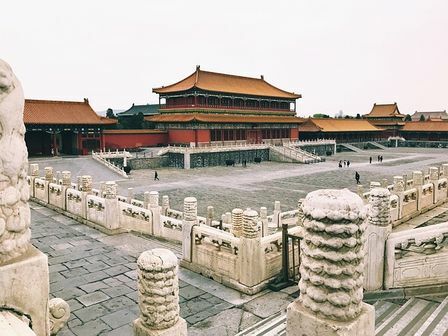 The sheer size of the Forbidden City require an extensive walk. The entrance of the Forbidden City is in the South Gate (Meridian Gate). The Meridian Gate was once used exclusively by the Emperor. Some of the state’s affair used to be conducted in the area, one of them is reviewing the imperial army and even passing judgements. You can reach the South Gate of the Forbidden City through the Tiananmen Square. The Tiananmen Square is house to many of China’s historic monuments such as the Monument to the People’s Heroes, the Great Hall of the People, and others. The name “Tiananmen” itself translates to Gate of Heavenly Peace. The place is accessible by public transportation. The exit is located in the North Gate, known by the name of Gate of Divine Might. You can also take the East exit if you want to go to Tiananmen Square. The East gate is also convenient to get to the shopping and food centre Wangfujing near the area. If you rented an audio guide, you need to return it once you get to the exit. Note that the number of visitors the Forbidden City accepts each day is restricted to 80,000 visitors. The number of tourists visiting China and the Forbidden City rise each year. Make sure that you go early especially if you want to buy tickets on the spot. The operating hours of the Forbidden City differs according to the months. From April to October, the place is open from 8.30 am to 5pm, while during November to March, the place is closed at 4.30pm. Last ticket sale is 30 minutes before the closing time. The Forbidden City is closed for maintenance every Monday. It’s advised to reserve the whole day to enjoy the Forbidden City and bask in everything the palace has to offer. Getting there early would be ideal as tourists peak at approximately 10 – 11 am, then peaked again around 1pm everyday. There is simply a lot to see and observe in this beautiful ancient palace complex. Enjoying it to the maximum by planning your day well and giving enough time slot for your visit. Entering the museums inside require a separate entrance fee.